he return of Dallas for me meant not only a nostalgic trip to my Texas childhood, but to my web beginnings in Los Angeles working on epk sites for television and film. 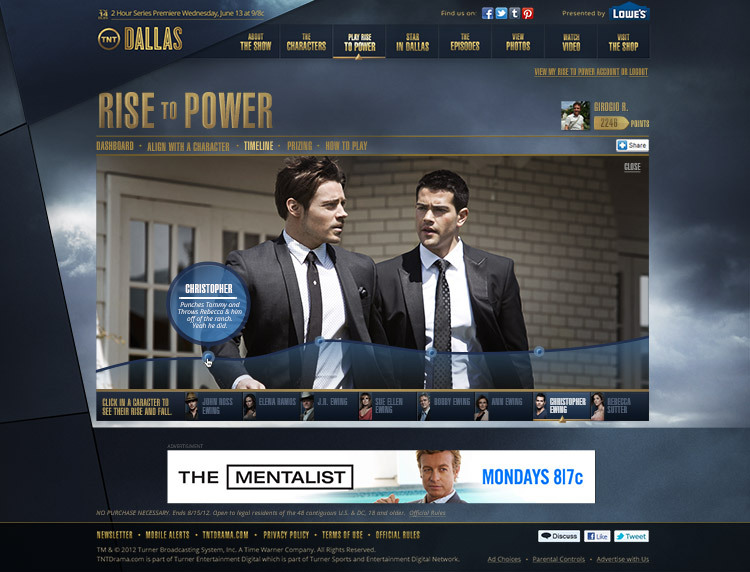 B-Reel was responsible for three large components of the digital campaign: the design of the campaign site(executed in-house by TNT), a personalized version of the famous opening credits, and Rise To Power, a sweepstakes disguised as a social media driven, fantasy football-esque game in which a player aligns with a character on a per-episode basis. The design epk site was quite challenging, being responsive, and having to seamlessly tie in to TNT’s legacy CMS, as well as the inclusion several of their partner systems such as Gigya, GetGlue, and Arktan. Design-wise we kept the pages as character-centric as possible, and updated the series identity with angular elements that emphasize that the family rift that’s become ubiquitous with the franchise. For the personalized show open, we wanted to give people the chance to create their own version of the famous opening credits of Dallas with their own family, friends and hometown (starring, of course, in alphabetical order). We stuck pretty closely to the original version, recreating it almost shot for shot, while updating the transitions a bit to match the new identity. There’s quite a lot going on behind the scenes of the opening credits to create a relevant and meaningful experience with Facebook, Google Street View, and very few additional assets. To determine the cast, we use Facebook to survey the user’s interaction with friends over the past year, picking out the people most relevant to the user. We were very careful to not limit this to digital interactions such as Likes and wall posts – we sampled for check-in’s and photo tags to ensure that the cast members chosen were actually part of the user’s offline life. As for the locations, we started with the address input by the user, cross referenced it with Facebook user check-ins, and leaned heavily on the Google Places API, searching for the most relevant landmarks near the desired end address. Additionally, we hand curated over 800 locations in major metropolitan areas, ensuring a great balance between a visually interesting yet personal experience. The concept of Rise To Power capitalized on the inherent drama of the series: the worst behavior wins. A user was challenged to align themselves with a character each week to gain points towards sweepstakes entries, and add to those entries via social media by sharing and joining in real time conversations with the characters on Facebook and Twitter. 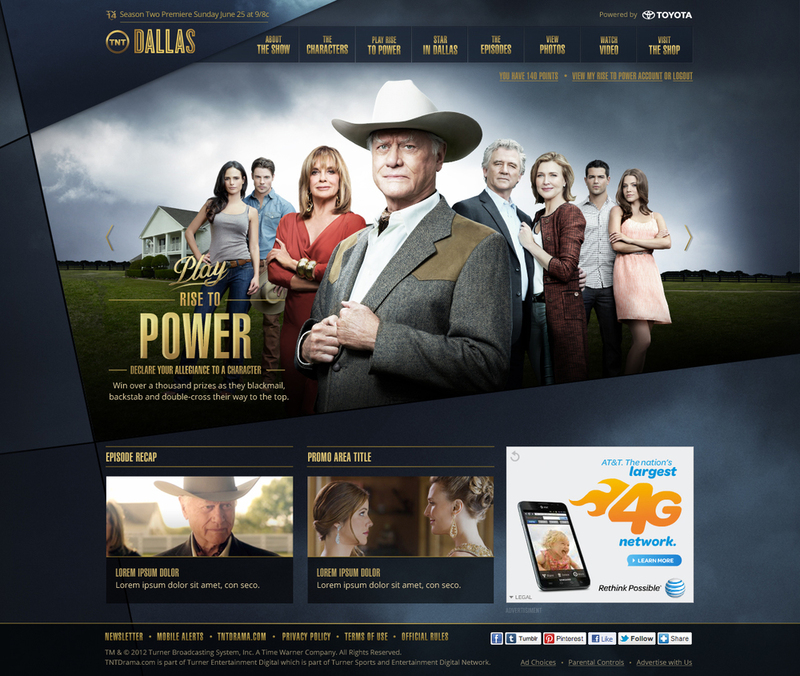 The rise and fall of each character was carefully mapped, and an interactive timeline showing that data created a lasting piece of legacy content reflecting the drama of the new Dallas season.